*The following Interview took place on July 15th, 2018 at HYPER JAPAN FESTIVAL at the Kensington Olympia in London, England. Four members of LONDON BLUE - KANA, KAYANO, KYOKA and RINKA - were in attendance for their London stage debut. The following write-up of the interview was published on September 4th, 2018, just a day before the groups major debut event with KING RECORDS. You can find the original write-up on the Selective Hearing website! Thank you for visiting, reading and supporting this blog and any other website I might be affiliated with. With a cool & cute image, as well as soundtracks inspired by UK Rock, bubblegum pop and R&R, LONDON BLUE is an all-female idol unit inspired by the UK! With five years to their name, as well as their up-coming major debut, the group has seen hardships and highlights since their beginnings in 2013, with the most recent highlight being their major debut with KING RECORDS on September 5th. 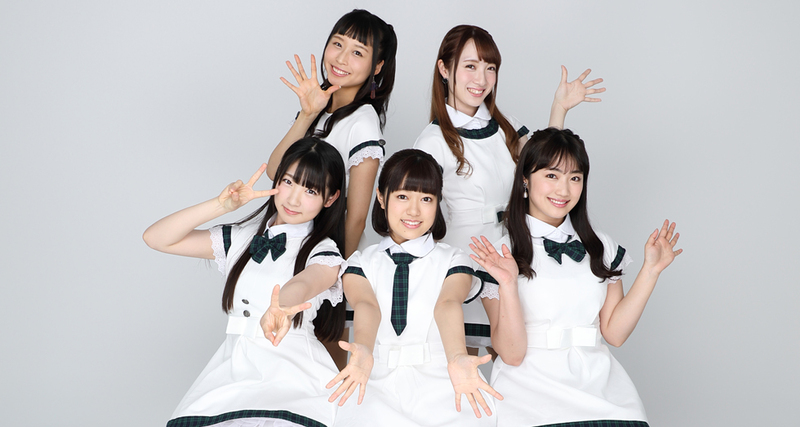 Made up of five members - KANA, KAYANO, KYOKA, RINA and RINKA - LONDON BLUE are known for their catchy songs mixed with 'cool and cute' visuals, as well as their entertaining stage presence. With three singles (two indies, one major) and an indies album to their name, there is no denying that LONDON BLUE are a little under the radar, but the group have found mild success in the past with their album track MIDNIGHT LOVER, which reached the #5 spot on the Japan weekly Usen hits back in 2016. Yet it is this year alone that has been one of LONDON BLUE's busiest. From the recent lineup change that introduced KYOKA, RINA and RINKA, LONDON BLUE also announced that they would make their UK stage debut at HYPER JAPAN in London, finally realising the groups dream of performing in the city that they are named after. With so much going on, from a UK stage debut to a major record deal for their up-coming single, LONDON CALLING, it seems like LONDON BLUE are heading towards a new stage, one that might have seemed impossible to reach five years ago. But it is the Hyper Stage where LONDON BLUE truly shined this year. With their towels in hand and energy boosted, four of the five members - RINA was absent due to a schedule conflict - took to their first London stage and dazzled the audience. With an updated God Save The Queenopening their act, cute and cool songs at their disposal and an enthusiastic audience, it's no surprise that LONDON BLUE found mild success during their two-day stint at HYPER JAPAN, particularly when it came to their meet and greet. It was after their first performance and meet & greet on the Saturday that Selective Hearing had the chance to catch up with LONDON BLUE to talk about the groups 5th anniversary, their up-coming single and the plans they had for touring London. *The interview was conducted almost entirely in Japanese, aside from one question which was lost in translation. Prior to the interview, I attended the meet & greet with the members after their live performance. It was a pretty busy affair that surprised both the members and their manager. Because of the sudden business the members were thrown into, the meet & greet was changed slightly so that fans could only take cheki with two members or all of them. Some lucky fans and attendees were able to snag individual cheki's, however. Once the interview took place, the members recognised me from the meet & greet and were notably excited and energetic. KYOKA was the first to greet me, enthusiastically jumping around and holding my hands as the others talked and cheered alongside us. It was a really warm and energetic greeting to say the least, and all of the members really tried their hardest throughout the interview to speak in English when they didn't understand a question I had asked. KAYANO especially did her best to interpret the questions despite none of the members really knowing any English, but she understood what I was talking about when I asked about the groups most recent single release, and translated for her fellow members. All of the members were very sweet, talkative, energetic and happy about being in the UK and visiting locations they have heard about or seen online or in films. Overall, this was a very positive experience and the members really cemented my liking for LONDON BLUE. This is a wonderful lineup, everyone seems really passionate about performing and being a part of the group, and of course they are simply delightful and sweet. I would go and see their performances once again, for sure. And now... TIME FOR THE INTERVIEW!!! - I am here at HYPER JAPAN today with LONDON BLUE, and they have just finished their performance with us. It was really amazing! So everyone, hello! Can you please introduce yourselves? KANA: We are a group that sing and dance to a genre called UK Rock, based on rock music from London and the UK, that's why we are called LONDON BLUE! KANA: I am the leader, KANA. I’m KANA. KAYANO: I’m the LONDON BLUE seiyuu who can dance and sing, KAYANO. Okay! KYOKA: I am the most energetic member in the group, my name is KYOKA (laughs). RINKA: I’m the member in LONDON BLUE in charge of the member colour Purple, I am Rinka. - So... welcome to the UK! Are you excited about your performance in London? LB: Exciting! Very, very exciting. LB: We love you! We love you. - So, LONDON BLUE was formed for the first time in 2013 and will soon celebrate its 5th anniversary. Congratulations! LB: Thank you very much! Happy Anniversary! - How do you feel about this achievement? KANA: Ah, yes. It's been a long ride, but on our fifth anniversary, being able to perform in London is amazing, I'm incredibly happy. I'm really happy. KAYANO: Mhm. Since joining London Blue there were many things we wanted to do for our fifth anniversary, so being able to do some of them makes me really happy. KYOKA: Being made a member of this group so near our fifth anniversary makes me really happy, and I would like to always shine next to LONDON BLUE. RINKA: I too feel like it's a dream that right after joining, we could come to London and perform together. So from now on we are gonna do our best. - Your group has themes around the UK and rock music, but are there any musicians or bands who personally inspire you? KANA: Yes, LONDON BLUE has a lot of songs that are inspired by the Beatles. That's why I'm inclined to say The Beatles. KANA: We also like London Calling (by The Clash). - I love London Calling, too. It’s very good. - For the new members, KYOKA and RINKA, how do you feel about performing in London right after your stage debut in Japan? RINKA: To be honest, I really can't fully believe I'm in London, but being on the stage and hearing everyone's voices was so much fun. KYOKA: It's like being in a dream, and I would like to thank all the people that came and heard us, I wanna say thank you to them. - And KANA, you have been a part of the group since 2014. As you have seen LONDON BLUE’s changes, what do you think about the newly formed group of five members and your major debut? KANA: I see… Well, not everything was easy and not everything was having fun, there were many hardships, but right now, next to our new members, experiencing these new things and being able to do so is so amazing. And being all together is really fun, so it makes me really happy, that's why we are going to do our best going forward as well. - And since KAYANO has become a 'senpai' in the group now, please tell me how LONDON BLUE has changed since adding three new members, and what hasn’t changed? KAYANO: … but also, our new members are really cute and cool, so our image of cool and cute has not changed. I think that is something that hasn't changed. - That's good! And soon LONDON BLUE will release a new single called LONDON CALLING. Can you tell me about it in more detail? KANA: On the 5th of September, we are releasing our major debut single, LONDON CALLING… do you want to hear about the song specifically? - Yes, please tell me more about the song. KANA: LONDON CALLING has to be accompanied by spinning your towel together with us in our live. That way we can enjoy it together. KANA: Yes, live towel spinning. Everybody can enjoy the song this way. - Hm, the audience in the UK is different to the Japanese fans, right? What were your expectations after seeing everyone today? KANA: About the fans… today everyone receives 100 points! They were very good. It was really great. KYOKA: Todays fans… they were good. KANA: Okay, so the audience… there was a lot of energy. RINKA: The power… Everyone gave us their power. Everyone. - We gave you power? KYOKA: And made us happy. - Because you are in London, is there something you want to do during your stay here? KANA: Shopping and tourism, too, through the streets. We also want to look at the buildings. KYOKA: Taking pictures… I want to take many pictures. KAYANO: Right? Yeah, that’s a good idea. It’s not like Japan. KANA: Ah, some buildings… they are really pretty. There are no buildings like that in Japan. RINKA: They are big English buildings, right? LB: A lot of pictures! RINKA: There was that place where The Beatles walked, too. KYOKA: We went yesterday, that’s where we went. - Did you take pictures? LB: Yes! Lots of pictures. - And Big ben? Have you been to Big Ben yet? KANA: Big Ben is today! - Unfortunately, RINA could not join you for this performance. Is there a souvenir you would like to bring back for her once you return to Japan? KAYANO: A souvenir? What could it be? KANA: Ah, but we took a lot of pictures that we want to show her, like of the dinners we had together. KYOKA: Show, show show show! Show her the pictures! KANA: We will show her a lot of pictures. KYOKA: The fashion here, too. - Ah, that’s cute. Well, we have come to the last question. Finally, please deliver a message to your fans, as well as everyone who has watched your performance? - To everyone, in Japan and England. KANA: From me, hmm let me see, to the people we just met, for watching us so much and taking chekis with us, and communicating with us, it was really fun, so next time, ah, we will do it tomorrow as well, but in the future I wanna come to London again and do a live performance. I really love you. KAYANO: It's our first travel overseas, so that London Blue was able to come to London made me really happy. That people from other countries and people from London were able to enjoy it makes me really, really happy, so I will also do my best to be able to come to London to perform again, and I hope everyone will come next time we are here too. KYOKA: Up until now, since joining LONDON BLUE, Kana and the rest have taught me so much, and seeing all the preparations for today, I just really wanna say thank you, so from now on I will continue to rehearse and get ready to convey wonderful things, I will do my best. RINKA: At first, when we all came to London and climbed on stage, seeing if the audience would be sad or if they'd enjoy with us really made me nervous, but we all did our best, so I wanna believe that reached the audience, and we had so much fun, and I think that reached them too, that's why I wanna continue to do my best and work hard so that next time we can also come and be on stage here. - Everyone, thank you very much! LB: Thank you very much! - Thank you! Thank you very much!